A family outside their B&B: Transrural promoted the benefits of good signage. 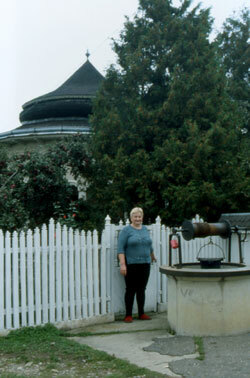 Most homes in Romania draw water from their own wells or springs but Transrural emphasised the importance of giving visitors the choice of bottled drinking water. B&B owners learnt the importance of a neat appearance and friendly welcome. Family-based B&B enterprise has strong potential to generate extra income, especially for the women in the family, yet requires high standards, good organisation, communication and effective promotion to entice visitors. 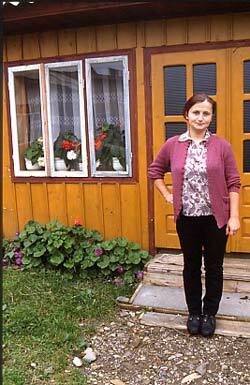 The combination of B&B with local crafts can create additional benefits. And so, when Romania’s national homestay association (Antrec) learned of Transrural’s work with women’s crafts, and approached us for assistance to build up their network of homestay providers in the remote northeast of the country, we were pleased to respond. Antrec’s regional branch in Piatra Neamt had made a start in developing a network of B&B providers but needed assistance in extending this into the more remote regions and promoting the area to foreign tourists. We therefore offered them a partnership with the aim of improving standards and make the region better known to English-speaking visitors. The potential for generating income from tourism is good. The region has unspoilt forests and mountains, strong craft and folklore traditions and the unique "painted" monasteries of southern Bucovina to visit. However, it is far from centres of population and roads are in poor repair. The potential for attracting foreign visitors had hardly begun to be exploited. At the same time, unemployment in this largely rural and forested region is high. But a significant number of households in the region have the capacity to receive visitors. With funding from Charity Know How (now Allavida) in 2000, we carried out an assessment of current homestay provision in the area, noting its strengths and weaknesses. Then we devised a programme of activities with women homestay providers to improve the facilities and services on offer. To help families cope with foreign visitors, we provided each host family with a copy of Romanian/English phrase book and provided dual-language information cards to help foreign visitors understand Romanian food and meals. We encouraged host families to set up displays in their houses showcasing local crafts, to integrate local craftspeople into the tourist scene. The homestay branch office also played its part by setting up a striking craft display inside its premises, including painted and beaded eggs, wood carvings, carved wooden spoons, traditional masks, bone carvings, wall hangings, woven and embroidered textiles and traditional clothing. We advised on standards of comfort and on pricing policy. We also helped with marketing. Host families preferred publicity photographs to show their houses in winter under heavy snow and we persuaded them that tourists from western Europe were more likely to visit in the summer and hope for sunshine. We shared ideas for extending the visitor season into the spring and autumn with special offers: Easter (Orthodox dates) for local religious ceremonies and traditions, May and June for hiking, September and October for mushroom gathering, October and early November for autumn tree colours. Families prepared itineraries for guests, including guided walks in the forest, expeditions by horse and cart, visits to local craftspeople, workshops and bazaars, and suggestions for walks and drives. Twenty-four host families benefited, with the women's role as income earners in their own right being further strengthened. 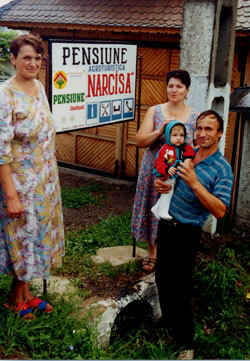 The establishment of local area groups encouraged women to take leadership roles. 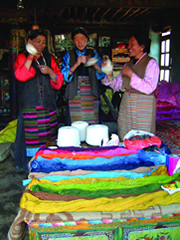 Craftspeople had the potential for higher sales through their homestay contacts. 24 is a small number, but such initiatives - and similar ones carried out with the help of other organisations - can help provide models for “scaling up” and spreading the impact across the remote and economically disadvantaged, yet beautiful and culturally rich, areas of Romania. Associations with national representation such as Antrec, and then via European networks, have the potential to stimulate up-scaling and replication of successful experience.